trees | What's Green with Betsy?!? Tomorrow is Earth Day – This year’s theme is planting trees, the first of five major initiatives earthday.org is undertaking to make a significant impact towards a cleaner, healthier, more sustainable planet. As Earth Day approaches its 50th anniversary, help earthday.org reach its ambitious goal of planting 7.8 billion trees! In addition to planting a tree (see recent blog posts about the importance of planting a tree and the proper way to do so), also consider the following. While everyday is really earth day, make a special effort tomorrow to honor our beautiful planet. Image and some information compiled from earthday.org. Organic amendments vary depending on the need of the soil and the plant. For example, the soil pH may need fixing, or certain plants like roses, azaleas or tomatoes may require specific minerals. Fish, blood or bone meal, charcoal, kelp, humic acids, earthworm castings are great amendments. Or, you can simply supplement your soil with compost, or decomposed organic matter, the most important and beneficial soil amendment. Compost builds soil structure and improves drainage; it helps with water/nutrient retention and air exchange; it introduces beneficial biology; it is vital for healthy roots, and healthy roots produce healthy plants. 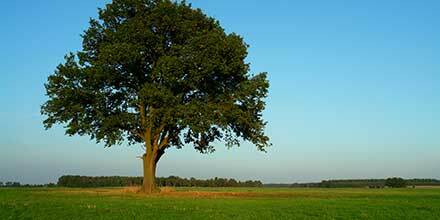 The social, aesthetic, and environmental benefits of trees are numerous. Trees reduce crime in low-income urban areas. Trees provide homes to wildlife. Trees provide a beautiful backdrop to outdoor recreational activities. Large and majestic trees are an important part of the community. According to American Forests, the national urban tree deficit now stands at more than 634 million trees. Alarmingly, up to 57% of all Amazonian trees, the planet’s lungs, may already fit the criteria of being globally threatened. Unprecedented environmental stresses – warmer temperatures, changes in precipitation, increased droughts – and global trade are making trees more susceptible to insect infestation and disease and therefore more difficult to grow and flourish in today’s world. Because trees sequester carbon and offset our carbon footprint, the amount of energy a person consumes in their day-to-day activities, it is more important than ever to plant trees. The average person produces 26 tons of CO2 per year. 6 twenty-five year old pine trees absorb 1 ton of CO2. 36 twenty-five year old maple trees absorb 1 ton of CO2. Planting trees is a way to give back to the environment for future generations and to offset our carbon footprint. Spring is the perfect time to plant. 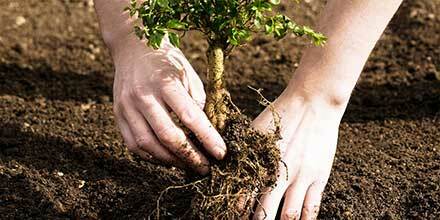 Plant a tree for a new grandchild, in memory of a parent or a beloved pet, or to honor a special anniversary. If you have no place to plant a tree, americanforests.org will plant a tree in your name with a small donation. Makes a great gift too! I love watching the trees take turns blooming this time of year. First the magnolia with its lovely pale pink flowers, followed by the cherries with their brighter pink and fuchsia blossoms, then the apples and their tufts of white flowers. Coming along is the golden chain tree with its delicate, dangling yellow flowers. The oaks are also flowering with their tender green leaves slowly emerging. (Did you know that all trees flower, some less conspicuously than others?) 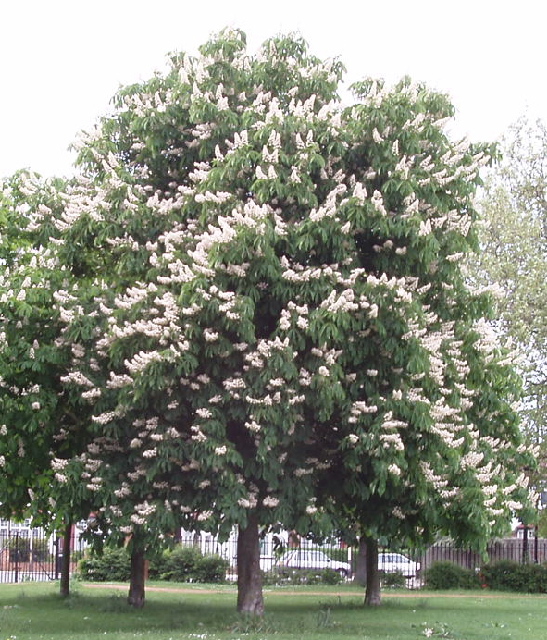 The majestic upright horse chestnut flowers are peaking and the fragrant purple lilacs are everywhere. Take a walk in your yard or around your neighborhood and appreciate the gift of trees. Trees like humans, need preventative care to ward off disease, especially as they suffer from environmental stresses like air pollution, soil contamination and compaction, exotic invasive insect pests, temperature extremes, devastating storms and drought. There are several organic approaches to prolong the life of a tree and maintain its good health and vigor. Fix the soil with compost and organic supplements. Raking leaves in the fall removes vital organic matter, and toxic chemicals and high nitrogen based fertilizers deplete the soil of important nutrients. It is imperative to replenish the soil with amendments or compost. Healthy, nutrient rich soil determines how well your trees grow. Consult a local arborist – a tree needs to be periodically inspected for structural defects, insect pests and disease. Trees should be pruned properly and focus on removing dead, dying, diseased and broken branches. Proper irrigation and mulching, especially in times of drought, are essential to maintain a tree’s good health. Trees play a critical role in the health of the planet. They are not living statues – they need care and protection just like any other living thing. Please help preserve these majestic beauties. Some information compiled from bostontreepreservation.com.